Acetobacter aceti temporarily accumulates acetate as an incomplete oxidation product when cultured in the presence of ethanol. The accumulated acetate is utilized as a carbon and energy source via the tricarboxylic acid (TCA) cycle after the depletion of ethanol by the phenomenon termed acetate overoxidation. In this chapter, we provide an overview of the genomic features and whole-genome transcriptional profiles of A. aceti NBRC 14818 when cultured under various growth conditions to understand the molecular genetic basis for the metabolic switching from incomplete ethanol oxidation to acetate overoxidation. The genes encoding enzymes of the TCA cycle and glyoxylate pathway and components of the branched electron transport chain exhibit dynamic changes in expression according to the carbon sources and growth phases. In particular, the TCA cycle genes of A. aceti are significantly repressed in the presence of ethanol. The low activity of the TCA cycle in the presence of ethanol may slow the metabolism of acetyl-CoA and lead to the accumulation of acetate. 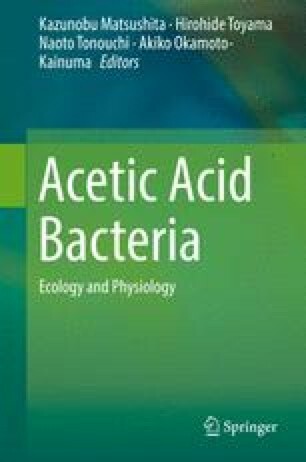 The presence or absence of glyoxylate pathway genes in the genome of acetic acid bacteria is also predicted to affect acetate productivity.